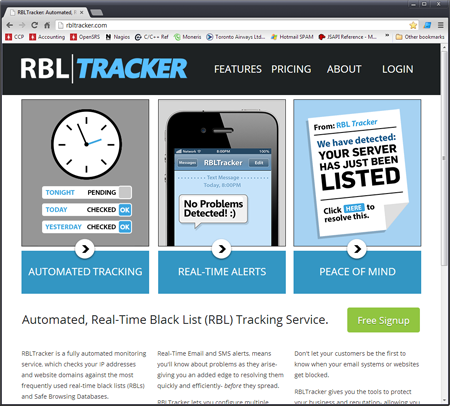 RBLTracker is a new project I’ve been working on- an automated, real-time black list (RBL) tracking service. The RBLTracker system automatically scans over 60 RBLs, and 20 URIBLs, multiple times per day, to see if any of your IP addresses or website domains are listed, giving you the peace of mind you need to focus on your business. The list of RBLs that RBLTracker monitors will always be kept up to date with the most current list. RBLTracker is a fully automated monitoring service, which checks your IP addresses and website domains against the most frequently used real-time black lists (RBLs) and Safe Browsing Databases. Get alerted immediately when one of your hosts is found on an RBL, URIBL, or in a Safe Browsing database. Your RBLTracker account can be configured with multiple email addresses and phone numbers, for receiving alerts about your hosts. Each contact can be individually configured with different notification rules, to control how each contact receives alerts when one of your hosts is blocked. 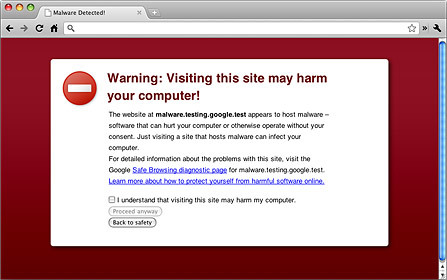 The Google Safe Browsing database includes lists of website domains that may be dangerous to visitors, because they are suspected of phishing or malware. RBLTracker will check your websites against the Google Safe Browsing database, and alert you immediately if any errors are found, ensuring that your visitors can reach your websites. RLBTracker includes a simple, read-only, REST based API, that lets you poll our database for the current status of your hosts. The RBLTracker API can easily be integrated into existing monitoring systems, like Nagios or Zabbix, by performing a simple HTTP GET request for the list of currently blocked hosts. The response data can be returned either as simple XML, or as a JSON object. Don’t let your customers be the first to know when your email systems or websites get blocked. This entry was posted in Development, RBLTracker and tagged rbl, rbl-monitor, rbltracker on 2013/01/18 by mike.